I recently moved from Tokyo to Amsterdam and have been enjoying a whole new world of ingredients to use in my cooking. And while this is a blessing and a rather exciting time, I’ve also been surprised by just how much I miss some particular Japanese flavors. One of these is matcha, a finely ground Japanese green tea. Matcha is commonly found and consumed all over Japan, primarily in traditional tea ceremonies where it is prepared and enjoyed in an articulate and beautiful style. This ceremonial grade tea is thick in consistency and often served with a piece of wagashi, a traditional Japanese sweet to help balance the bitterness of the tea. I’ve enjoyed this special experience in tea houses all over the country. From ornate gardens to ancient bathhouses, it’s an extraordinary ritual to savor. However, this is only the beginning! Matcha is commonly used as an ingredient in all kinds of dishes too, especially sweets. I’ve seen (and before keto, eaten!) it in desserts such as castella, manju, pancakes, kakigori, waffles, dango, ice cream, monaka, mousse, mochi, cheesecake, parfait, donuts and more. This flavor is truly adored! 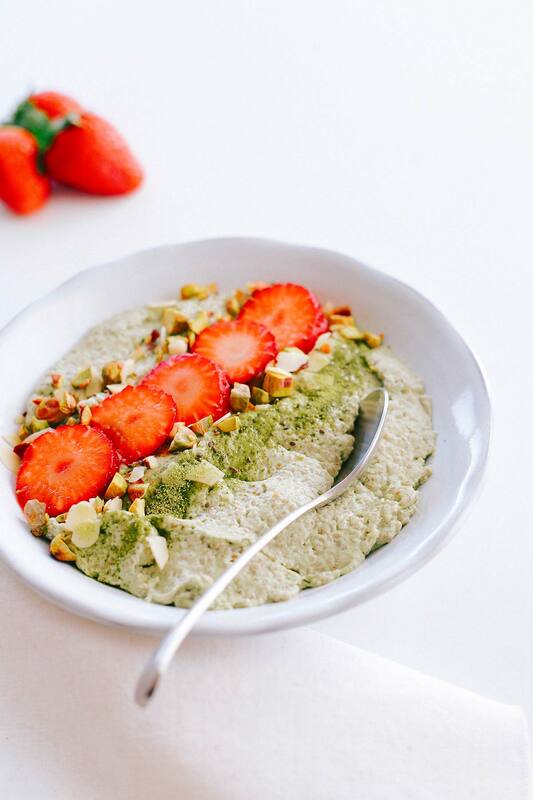 I want to experiment with making some of these Japanese matcha treats more keto friendly, so am starting things off with this super simple matcha chia pudding. Like my coconut, blueberry and chai flavored chia puddings; the ingredients are super simple: white chia seeds, coconut milk, matcha and sweetener (if you like). To make it pretty, you can top this delicious pudding with whatever you have handy. 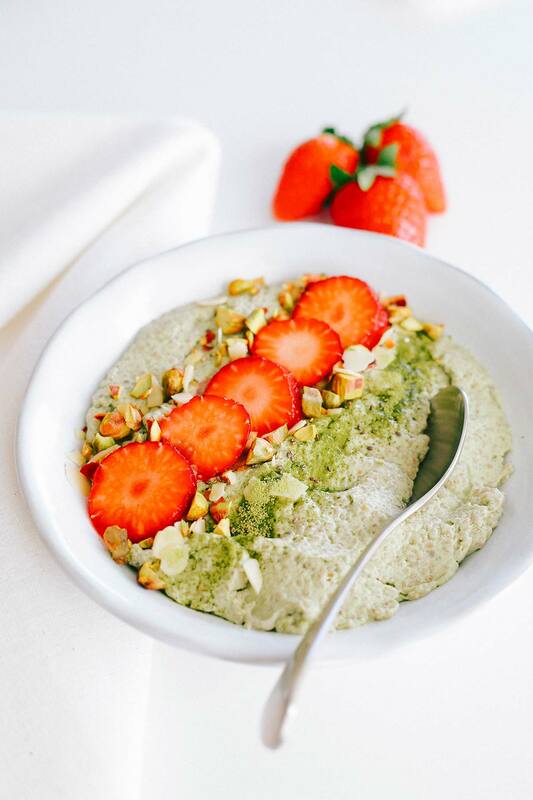 I opted for a sprinkling of matcha powder, some strawberries, flaked almonds and crushed pistachios; which add a nice little crunch to the texture. 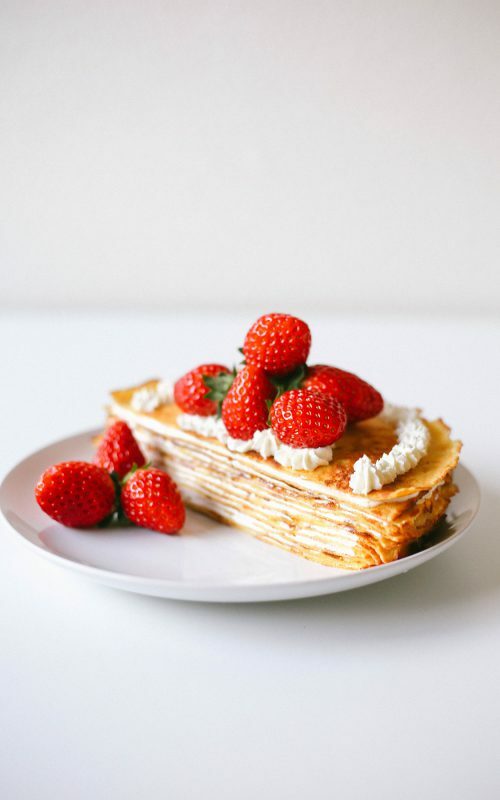 This one makes the perfect breakfast or even a special little dessert! 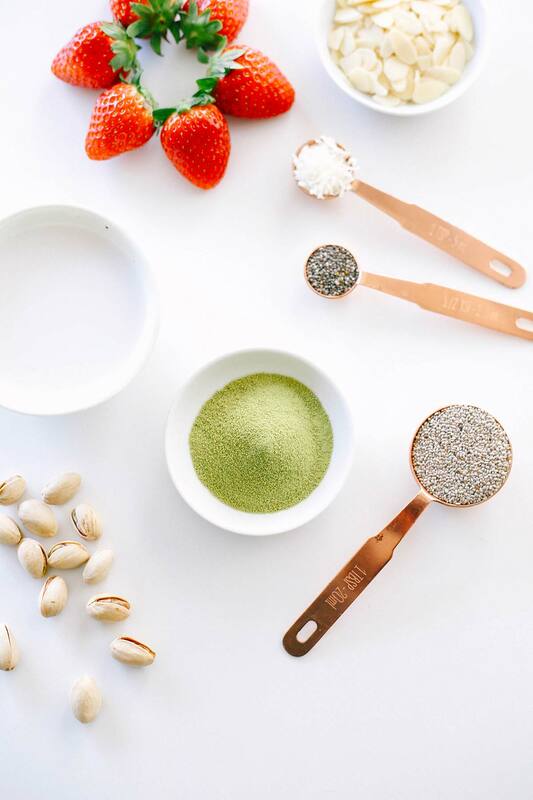 When selecting matcha, it’s important to know a little about the various grades as price points can vary wildly. There are two main categories, ceremonial grade (you guessed it, for tea ceremonies) and culinary (again, for cooking). Ceremonial grade is the best of the best, while culinary grade is broken down into further categories such as cafe, kitchen or classic. In my experiments I’ve noticed the absorbency of chia seeds can slightly differ between brands, along with the thickness of coconut milks. This recipe and portions work well with the products that I have, but the portions may need a little adjusting to get the perfect pudding consistency. 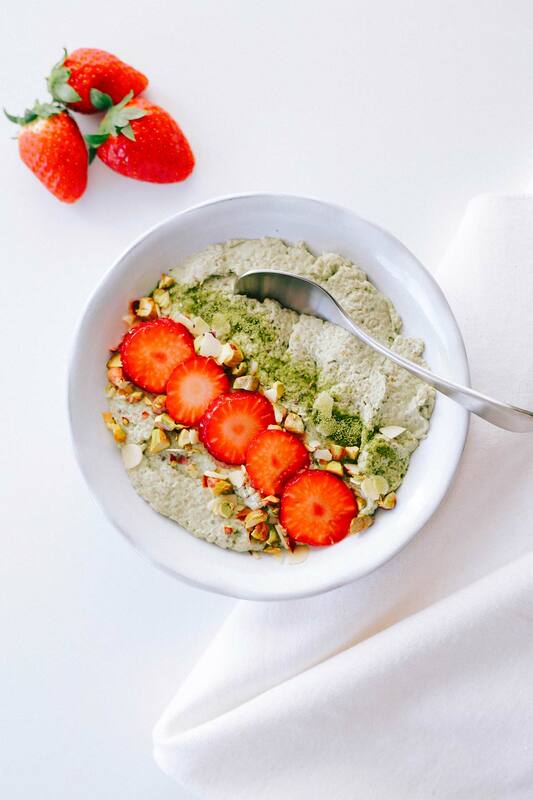 Prepare the night before by mixing the chia seeds, coconut milk, matcha powder and sweetener in a bowl. 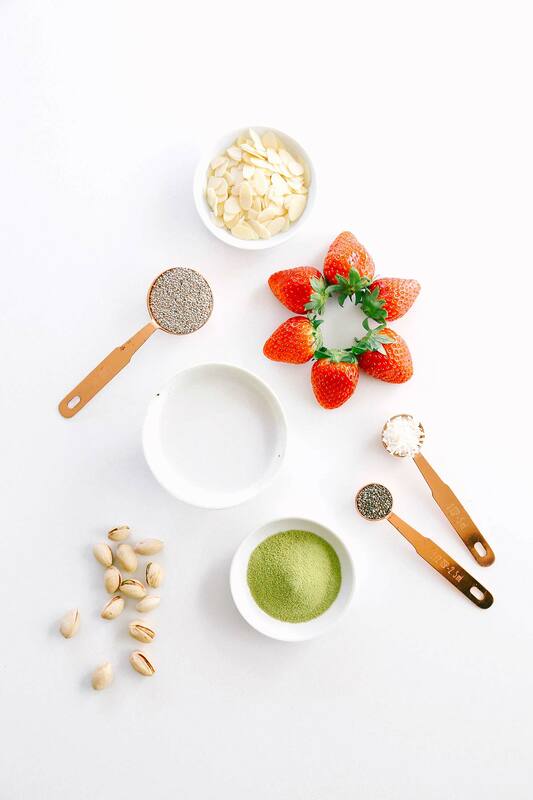 Blend until the ingredients are well combined. Transfer to a bowl and put in the fridge for 6-8 hours. In the morning the chia seeds will have absorbed the liquid and the mixture will have thickened into a pudding that’s ready to eat. 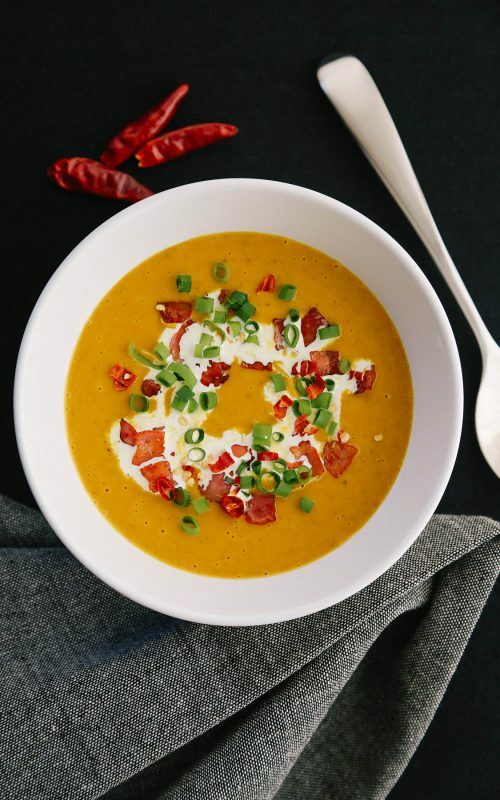 This recipe is best served cold. 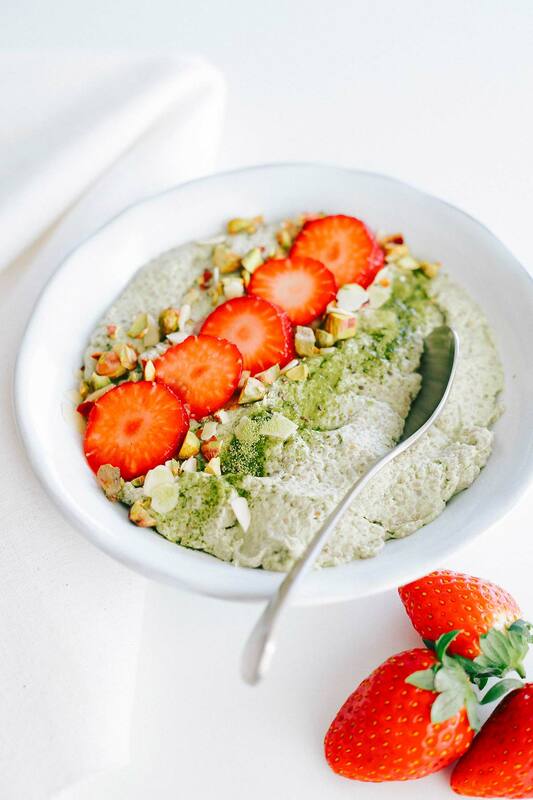 Top the pudding with matcha powder, strawberries, pistachios and flaked almonds. Enjoy! Beautiful! 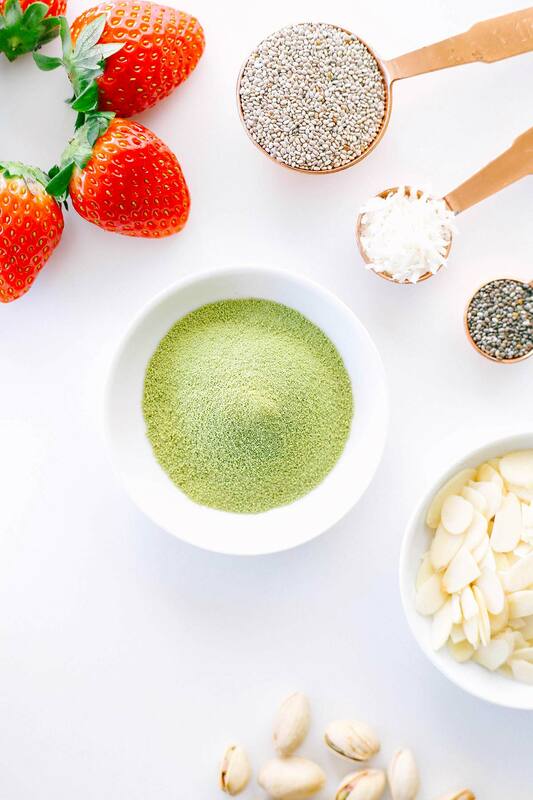 Matcha is a favorite flavor of mine and I am often on the hunt for matcha flavored keto food. It’s probably sacrilegious, but I like to make a matcha latte when I need to bump up my fat macros… or when I need an afternoon pick me up. I love your blog – keep up the gorgeous work! Hi Ally, thanks so much for your kind words! Don’t worry, though they’re not exactly traditional, matcha lattes have become pretty popular in Japan too. Thanks for such a brilliant idea, I’ve never tried making one at home and now I most certainly will! Do you have a preferred brand of coconut milk? Hi Katie, I use a wide range of brands depending on what’s available in my local Asian grocer or online! Be sure to check the labels as carb counts can vary widely. I generally try to find an organic full-fat brand like this one. This pudding is just delicious. I will do my best to have it ready for the next brunch with my friends. Wish you could also share a video of yourself preparing it. 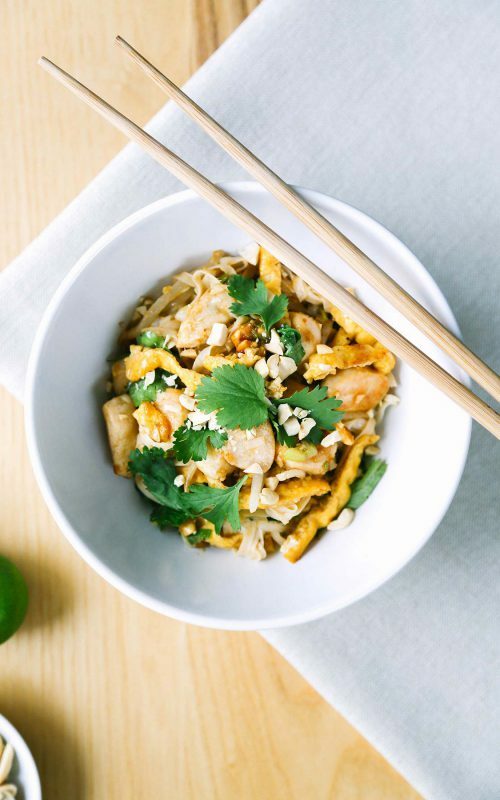 The recipes of this particular blog along with the recommendations of Dr. Berg have helped me drop 3 sizes in one month. 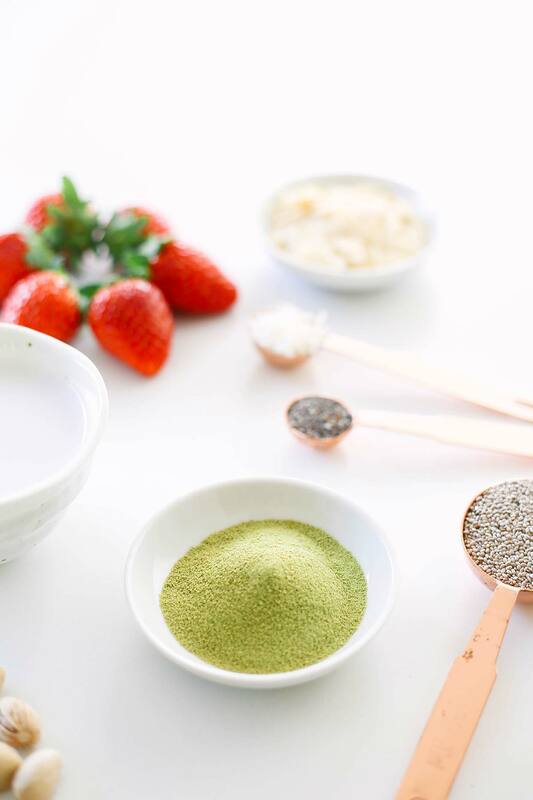 Matcha is not only high in antioxidants but also boosts memory and concentration and detoxifies the body faster than other substances.